For generations of Baylor fans, it may be hard to believe that more than a quarter of a century has passed since Grant Teaff’s legendary days as head coach of the Baylor football team. His statue stands alongside the path between campus and the Umphrey Bridge leading to McLane Stadium, immortalizing the winningest coach in Baylor football history. 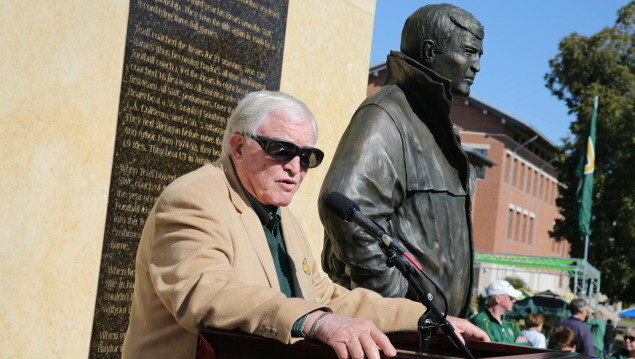 The students who pass by that statue en route to Baylor games weren’t yet born when Coach Teaff won his final game at Baylor, leading many to know only a few basic details about the man who re-established Baylor football on a national stage a generation ago. Born Nov. 12, 1933, Teaff was not a big name in the football world when he arrived on campus in 1972, and neither was Baylor. The program had won only seven total games in the prior five years, and Baylor was reportedly considering dropping out of D-1 football. A native West Texan with previous head coaching stops at McMurry and Angelo State, Teaff and Baylor proved to be a perfect fit. After two seasons spent laying the foundation in 1972 and 1973, the Bears and their young coach were ready to shock the world. Ask any Baylor Bear fan of a certain age about 1974, and their memories will quickly turn to a “miraculous” football win. Down 24-7 at halftime to Texas at then-Baylor Stadium, the Bears stormed back for a 34-24 victory that became known as the “Miracle on the Brazos.” That victory spearheaded the Bears’ charge to the 1974 Southwest Conference championship — Baylor’s first in 50 years. Six years later, Teaff would lead Baylor to yet another conference championship. Some of the most legendary names in Baylor history played under Teaff, including Mike Singletary, Walter Abercrombie, Alfred Anderson, Dennis Gentry, Mark Adickes and Santana Dotson. All told, the Bears won 128 games in Teaff’s 21 seasons, finishing the season among the nation’s top 25 six times and making eight bowl appearances. After stepping down as Baylor’s head coach following the 1992 season, Teaff went on to serve 22 more years as executive director of the American Football Coaches Association (AFCA). He was inducted into the Baylor Athletics Hall of Fame in 1993, the Texas Sports Hall of Fame in 1995, and the College Football Hall of Fame in 2001. Through it all, he’s remained a steadfast supporter of Baylor University and a leader recognized throughout his profession as a “gentleman coach,” as Matt Rhule described him after taking over the Baylor head coaching job in 2016.